Two days tour: Charyn canyon. Kolsay, Kaindy lakes. Three days tour: Altyn-Emel national park. Kolsay, Kaindy lakes. This lake is nearly unknown despite its spectacular beauty. This may be because of the Kolsai lakes that are located nearby and distract all attention of the tourists coming to this area. Translated from Kazakh "Kaindy” means "full of birch trees”. 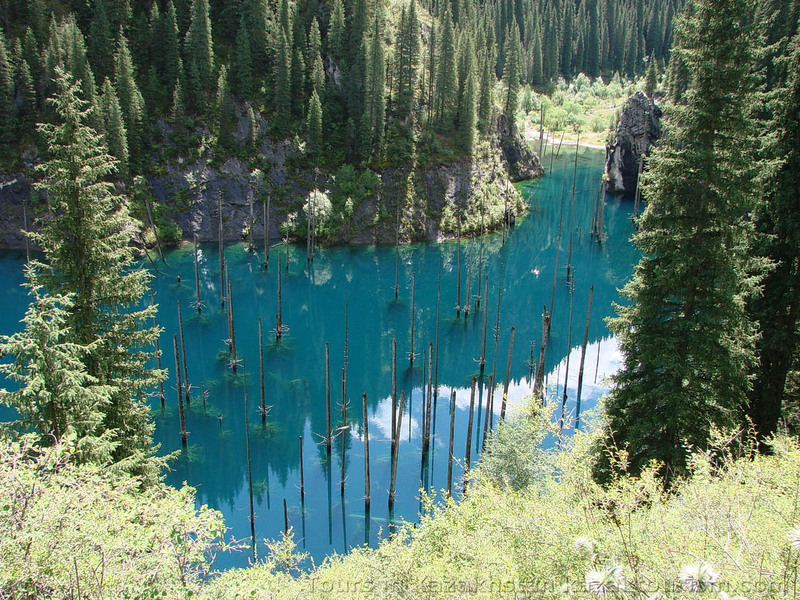 Indeed, the lake Kaindy became its name because of the large birch grove located 5 kilometers far from the lake. There are several explanations how the lake appeared. One of the theories says that the young lake Kaindy appeared about one hundred years ago in 1911 or in 1938, the other one tells us that the lake was formed during the Zhalanash earthquake in 1978. Anyway, we can only affirm that the lake was formed by the mountain landslide caused by an earthquake. The created basin was filled up with water. 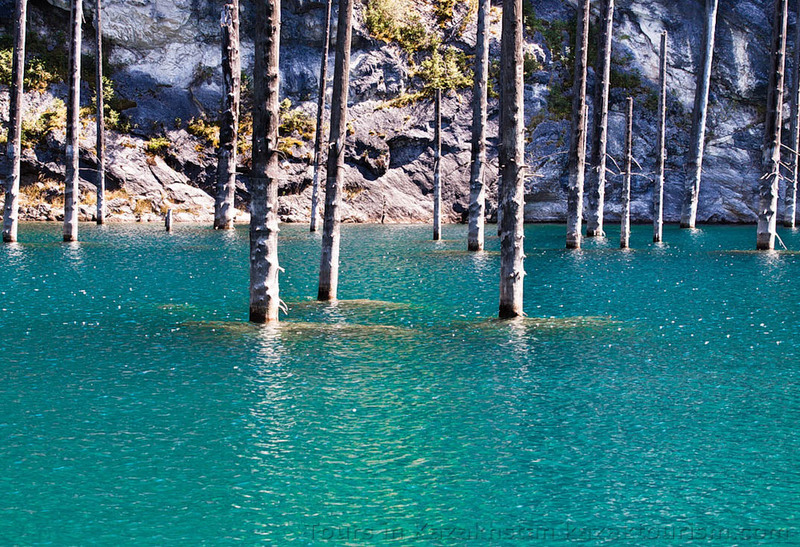 The fir trees growing in the basin happened to be flooded and now dried fir tree stumps sticking out of the cold smooth surface of the mountain lake create an amazing and unique scenery. Fish does not inhabit the flooded wood, but there is trout inhabiting the river flowing out of the lake. The lake is located 2000 meters above the sea level. Because of the ice-cold water the century-old fir tree stumps are perfectly preserved. The lake is very popular with divers and amateurs of the unusual water excursions. The tourist fans love this lake as well. If you follow the links below you will find the description of two or three days’ excursions to the Kaindy lake from Almaty. Kaindy lake is one of the most beautiful places of the Almaty region and it is for sure one of the most amazing natural spots worth seeing in Kazakhstan. We wish you a nice journey and many unforgettable impressions!